SPY rose by 1.2% this week, returning to its high of the year back on MR 30. My account fell 0.4% to its third-lowest value of the year. The loss-floor is now -9.0%. Bankster activity: For the first time since 2008, the US Fed has started doing “repos” again. This is where they print up some money and give it to crony banks in exchange for worthless IOU’s, because the alternative would be that “too big to fail” banks would fail. At least $600 million has been printed during these small-scale tests over the last week or so. On Wednesday, it came out that the Bank of Greece printed €800 million (with tacit approval from the ECB, despite the blatant Maastricht treaty violation). Presumably this was done because the alternative would have been a complete collapse of Greek government. It seems that Greece will need to print €3.2 billion of the common currency over the next month, which means the wealth of all Europeans is being secretly diluted to support those banksters who loaned money years ago to other banksters, who had borrowed in the name of the people of Greece. On Thursday, it was reported that a US appeals court has affirmed a lower court’s ruling that when a futures brokerage pledges its customers’ money to a TBTF bank to cover the brokerage’s own debts, that is not “fraud” and the bank need not return the stolen money to the retail customers. It seems the USA has only one law right now: the TBTF banks are always right — this law supercedes all others. It is unclear whether this latest ruling applies only to futures accounts. I have a retirement account. There are many laws limiting what a brokerage can do with retirement money, but perhaps the “one law” supercedes all of those. Mark Carney, head of the Bank of Canada and also of the world Financial Stability Board, has now officially refused the offer to become head of the Bank of England as well. He says he will “blow the whistle” on banks that fail to adhere to the new capital requirements and believes that Canadian banks will meet these requirements years before everyone else. It sounds to me like he is threatening any world banksters who fail to join his team — will his next job be grand nagus? The world of sports: This weekend, the Olympic Games will end. Many stock traders have been enjoying them. There will be a let-down next week because no more enjoyment of that type will be available for several years. Historically, the stock market tends to fall during the week after the games. floor: The loss-floor briefly went below -12% on Tuesday, but picked up again by the end of the week so I didn’t have to lower the bottom on the weekly-progress chart above. Quote-fetch system: Worked fine until Friday. The 11am, 12pm, and 1pm fetches all timed out after 60 seconds, while the 2pm, 3pm, and 4pm fetches barely succeeded in slightly less than 60 seconds. Problem doesn’t seem to be at Schwab’s end, while my ISP does not seem otherwise slow. I had to go out on Friday, so it was a bad day for the robot not to be working. On Saturday, test quote fetches continued to be problematic, until I ran Opera interactively on the server; after that things seemed to work again (but we’ll have to see next week). My ISP now says that I am allowed 200 MB of RAM for my processes, but I don’t remember what the old number was (or if it was different). There seems little point in complaining to my ISP about this; they’ve already said they think I should upgrade to a virtual private server. I think it is wrong of them to remove features (such as last year’s ability to recompile my own programs, and perhaps now the ability to run programs larger than 200 MB) from a service that I have already paid for in advance — they should refuse to renew if they don’t want to continue their business on current terms. My lease with them expires next month; perhaps I should find a new home for my robot. Further research has suggested that it is illegal for me to move my account from Schwab to Interactive Brokers — or to anyone else. Because I am not a US resident, no broker is permitted to open a new IRA account for me and so my money is stuck at Schwab forever. However, last year Schwab bought OptionsXpress, which offers an API to their trading system. I should call Schwab to find out whether moving from Schwab to OptionsXpress is permissible for non-resident IRA’s. TNA: Yet another loss. There was a sudden downdraft on Friday just after 11am, causing a stop-out with slippage. Without that event, the rest of the day would have been okay and I would still be holding TNA, which might very well go up early next week. But it seems sudden downdrafts often presage more sustained downtrends, so it’s quite possible that the loss would have ended up being just as large but postponed into next week. SRTY: The quote-failure at 11am prevented robot purchase, but I didn’t notice until noon. I entered the order manually at “market price” and then left the house. It just so happened that I got the exact price that the model had called for an hour earlier. 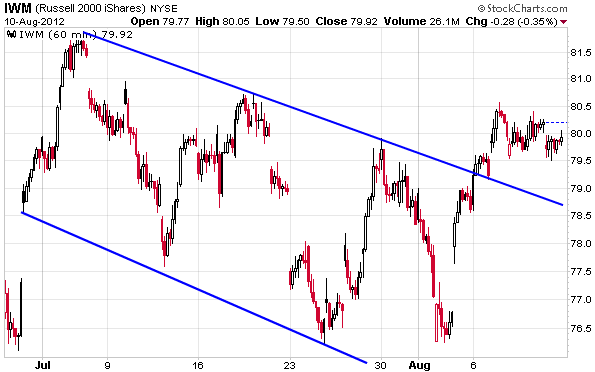 The market zoomed up to the channel line in the first half-hour of Monday, continued rising until 1pm, then fell back to the channel line for the close. On Tuesday it gapped up and spent the rest of the week doing a “bull flag”. I think it will drop back to the upper channel line next week — but after that it might fall back into the channel (and start heading towards the lower line) or perhaps it could bounce off the upper line and then begin a period of serious uptrend (presumably fuelled by bankster money-printing since the fundamentals are all very bad these days). I’m leaning bearish, but there’s just no way to know. The market remains stuck in the same ±3% range that it’s been in for two months now. I haven't gained or lost any significant money during this time. My understanding is that many traders more seasoned than I have had similar experiences. This has not been a good year for trading! Just my luck. I put in a limit-order to try to get last Friday’s price, but gold never got that low this week. Gold has closed higher for six days in a row. The last time that happened was early June, after which gold spent the next three days going straight down and giving up all six days’ gains and more. I will give my limit-order another week. David Banister suggests that gold should be bought when it reaches $1630/oz, which happened for a moment Friday morning (followed by falling prices for the rest of the day). Sy Harding says his indicators are hovering just below a “buy” signal for gold and he is waiting for $1645/oz (the 30-week moving average). I think this means that neither of them has bought yet, and I haven’t either. 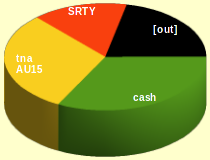 SRTY has been my best-performing model this year, yielding 1.2% of profit over four months with a win:loss ratio of 7:11. I could jack this up by e.g. buying two tranches instead of one, but that would tie up a lot of money and I don’t have much left. Another approach would be to buy IWM puts instead of SRTY shares. They require much less capital so I could buy more (potentially a lot more) of them. However, this would require requesting “Options level 1” from Schwab, which I became eligible for as of Christmas 2011 (but I never sent in the request).